Food, music and your sweetheart! Does it get any better? 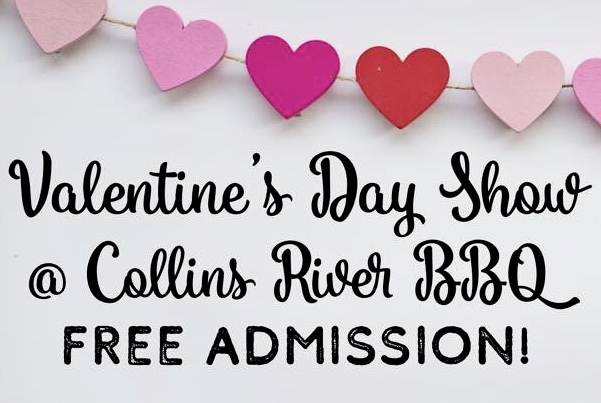 Come find out at Collins River BBQ on February 14, 2019. Not only is this a fabulous place to eat anytime, it’s also a great place to listen to music. Free admission to the show makes this date even better. Located on Main Street in downtown McMinnville, TN you are just a 40 minute drive from any of our beautiful cabins. Make your plans today to come on out and enjoy food, music and of course your sweetheart! WE DO HAVE AVAILABILITY FOR VALENTINES WEEKEND, SO GIVE ME CALL AND MAKE YOUR RESERVATION TODAY!